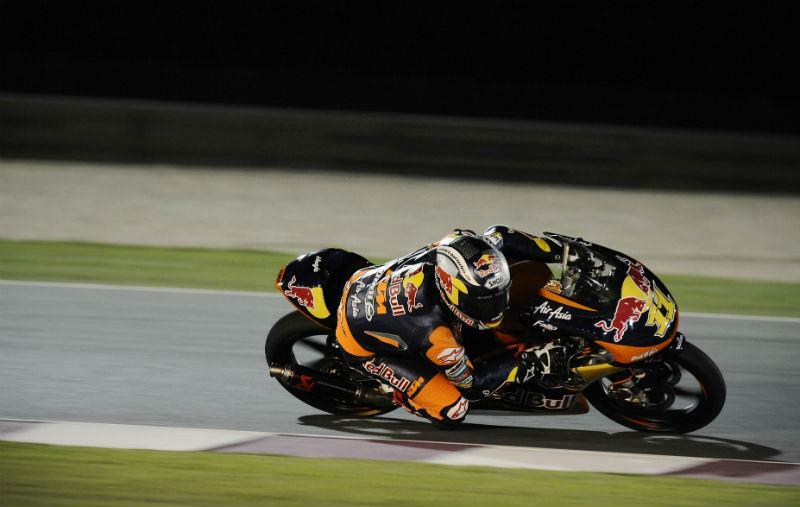 Red Bull KTM rider Sandro Cortese has taken the first ever Moto3 pole position under the floodlit Losail circuit in Qatar today, with a time of 2:08.188. Cortese pipped Spaniard Maverick Vinales to pole position right at the end of the session, beating the FTR Honda rider's time by 0.016secs. Frenchman Louis Rossi completes the front row in third. Brit Danny Kent will start tomorrow evening's race at the back of the fourth row in 12th, 0.938secs behind team-mate Cortese. Fellow Brit Danny Webb continued to struggle onboard his Mahindra, setting the 25th fastest time.